First of all, we would like to mention that we have no intention of making you feel bad about your life with this article. 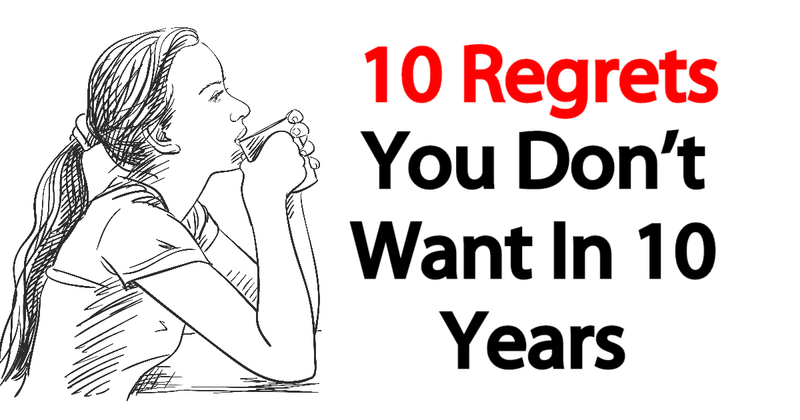 Instead, we want to remind you that it is not too late to make changes in order to avoid living with regrets. One nurse from Australia who spent a lot of time with terminally ill patients has shared the biggest regret that most of the patients had. After hearing the stories of many people she said that most of them hadn’t fulfilled even half of their dreams which resulted in having many regrets. They all wanted more time to do the things they always wanted to. Instead of waking up in 10 years and realizing that you have done nothing to fulfil your goals, start doing that today. And don’t think that you don’t have the time because one day you will really run out of time and you will be only left with regrets. This was the second largest regret of the patients. No matter what we are told, money can never buy happiness. Sure it can make your life a lot easier, however when you grow old you count memories, not money. Being too preoccupied with your work and not working on maintaining your relationships with your friends and family can make you feel empty inside. Holding back your feelings can haunt you later in life especially if you try hard to suppress your emotions. If you don’t show or tell how you feel about someone that person might never know that. This also applies to lying or covering the truth. If you want to say something so bad that you can’t sleep at night, just say it. If you want to call your high school friend, don’t wait anymore, call them now. Or if you met someone at a party and you want to get to know them better, call and ask them out on a date. Even if you get rejected at least you will know what would have happened instead of just wondering. Life is too short, so make sure you keep in touch with the people you care about. Even though are emotions are greatly affected by outside factors, we have most of the control over them. We choose how to react to a certain situation. Instead of wasting time feeling angry or holding grudges, try to choose happiness as often as you can. This way you will bring more positivity in your life and relationships with others. The way you perceive the world determines your emotional, mental and physical health, so change your way of viewing things if you want to live a better life. Worrying about what others might think about you will never make you happy or successful, especially if you refrain yourself from reaching towards your goals. The opinion of others should never affect how you feel or act so make sure you follow your heart and stop thinking about others. Many people spend a lot of time worrying even when there is nothing they can do about a certain situation. This only creates an additional burden which can eventually drown you emotionally. By the end of your life you will learn that the unpaid bills, or little money you have made are nothing compared to the gift of life which you should appreciate more. When you are young nothing seems impossible and you feel like you are going to live forever. Eating unhealthy, drinking, smoking and staying out till the morning might seem a great idea at the moment but the unhealthy habits will eventually catch up with you. Instead of regretting the past mistakes, try changing your lifestyle for better starting today. Each new day is a miracle so never take it for granted. Our lives have become so busy that we forget to stop and think about how lucky we are to be alive and well. Take time to appreciate the sun, the smell of flowers or the beautiful view from your balcony. People have trouble living in the moment. Some are looking back to the past and others are worried about the uncertain future. However, we neither have the ability to change the past nor the ability to predict the future. Instead, you should be present now and enjoy this moment. You have a limited supply of such moments so try to take advantage of them now that you can instead of regretting it in the future. Kiss your children goodnight, go mountain climbing, cuddle with your partner… Don’t play life too safe by planning your future. Only you have the power to change your life for better. We are stuck in our everyday habits which make it difficult to escape the routine, however with dedication and hard work anything is possible. Don’t wait until it is too late, take the next step and don’t stop until you have done everything you always wanted to.